A vacation to remember on Dauphin Island! Island Paradise – 3 Bedroom/2 Bathroom house located on a cul-de-sac on the well protected East End in the premiere location of Pass Drury, Enjoy sunsets over deep water British Bay. 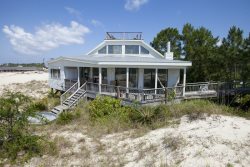 You will have easy access to the Gulf, Mobile Bay, Fowl River and Dog River. Great vacation home to come and relax on the bay. Plenty of room to park your boat in the circular drive or dock allows for a boat slip for a 21' boat. Gather around the 13 ft. granite kitchen island which is the centerpiece of the house. This deluxe kitchen has all stainless appliances - Bosch dishwasher, GE Profile range and microwave, built-in refrigerator, ice maker and drink cooler. Relax in the 24x21 den with picture window and built-in bookcase or play pool and watch TV. Ceramic tile floors, slick ceilings with canned lights throughout living areas. Enjoy your meal in the dining room with a view! The master bedroom features a deluxe bathroom, walk-in closet and a picture window view of the water. Nice wood deck off breakfast room a deck with a swimming pool will allow for enjoying those sunsets and a dock to enjoy catching specks.